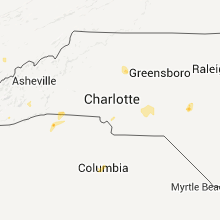 The Five Forks, SC area has had 0 reports of on-the-ground hail by trained spotters, and has been under severe weather warnings 52 times during the past 12 months. 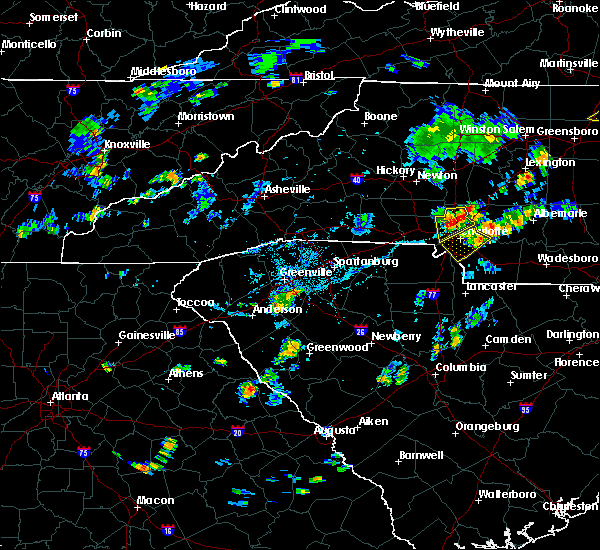 Doppler radar has detected hail at or near Five Forks, SC on 42 occasions, including 6 occasions during the past year. 4/19/2019 6:42 PM EDT At 641 pm edt, a severe thunderstorm was located 13 miles south of columbus, or 5 miles northeast of lake robinson, moving northeast at 35 mph (radar indicated). Hazards include 60 mph wind gusts. Expect damage to trees and power lines. locations impacted include, columbus, greer, taylors, five forks, boiling springs sc, duncan, lyman, landrum, wellford and inman. 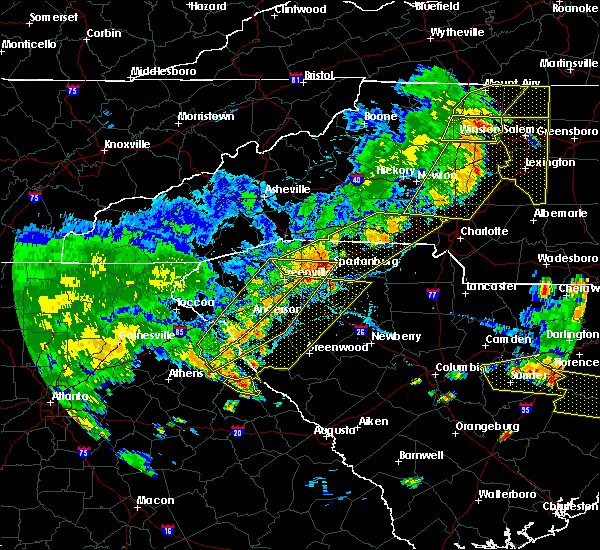 A tornado watch remains in effect until 800 pm edt for western north carolina, and upstate south carolina. 8/9/2018 6:06 PM EDT At 605 pm edt, a severe thunderstorm was located 14 miles southeast of downtown greenville, or near fountain inn, moving southeast at 15 mph (radar indicated). Hazards include 60 mph wind gusts and quarter size hail. Minor hail damage to vehicles is expected. expect wind damage to trees and power lines. Locations impacted include, simpsonville, five forks, fountain inn and woodruff. 8/9/2018 5:44 PM EDT At 543 pm edt, a severe thunderstorm was located 9 miles southeast of downtown greenville, or near five forks, moving southeast at 15 mph (radar indicated). Hazards include 60 mph wind gusts and quarter size hail. Minor hail damage to vehicles is expected. Expect wind damage to trees and power lines. 8/6/2018 5:25 PM EDT At 525 pm edt, a severe thunderstorm was located 15 miles northwest of laurens, or near fountain inn, moving southeast at 10 mph (radar indicated). Hazards include 60 mph wind gusts and quarter size hail. Minor hail damage to vehicles is expected. expect wind damage to trees and power lines. Locations impacted include, simpsonville, five forks, fountain inn, gray court, hickory tavern, fork shoals, ora and enoree. 8/6/2018 5:02 PM EDT The national weather service in greenville-spartanburg has issued a * severe thunderstorm warning for. 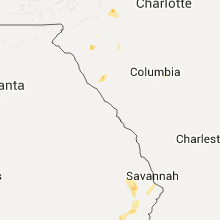 northwestern laurens county in upstate south carolina. southeastern greenville county in upstate south carolina. until 545 pm edt. 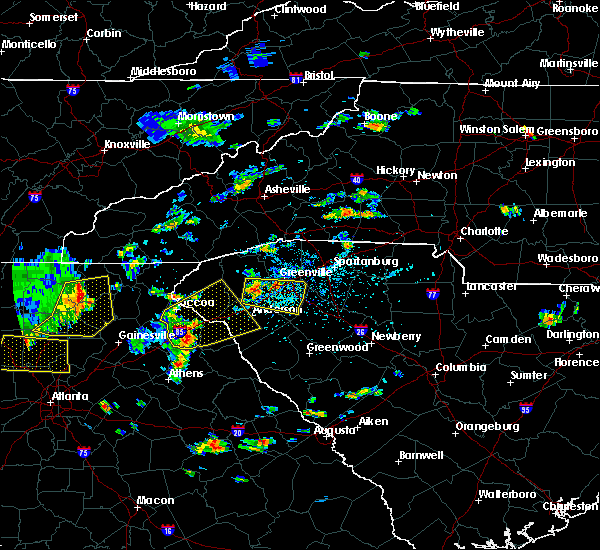 At 501 pm edt, a severe thunderstorm was located 13 miles southeast. 7/17/2018 6:37 PM EDT The severe thunderstorm warning for northwestern laurens and southeastern greenville counties will expire at 645 pm edt, the storm which prompted the warning has weakened below severe limits, and has exited the warned area. therefore the warning will be allowed to expire. however gusty winds and heavy rain are still possible with this thunderstorm. 6/27/2018 4:43 PM EDT At 443 pm edt, severe thunderstorms were located along a line extending from 7 miles southeast of greenville downtown to 11 miles east of anderson, moving southeast at 30 mph (radar indicated). Hazards include 60 mph wind gusts and quarter size hail. Minor hail damage to vehicles is expected. expect wind damage to trees and power lines. Locations impacted include, anderson, mauldin, simpsonville, fountain inn, homeland park, powdersville, piedmont, belton, williamston and honea path. 6/27/2018 4:23 PM EDT At 423 pm edt, severe thunderstorms were located along a line extending from 4 miles east of easley to near anderson, moving southeast at 20 mph (radar indicated). Hazards include 60 mph wind gusts and quarter size hail. Minor hail damage to vehicles is expected. Expect wind damage to trees and power lines. 6/26/2018 4:10 PM EDT The severe thunderstorm warning for east central greenville and west central spartanburg counties will expire at 415 pm edt, the storm which prompted the warning has weakened below severe limits, and no longer poses an immediate threat to life or property. therefore the warning will be allowed to expire. however, gusty winds are still possible with this thunderstorm. 6/26/2018 3:52 PM EDT At 352 pm edt, a severe thunderstorm was located 4 miles northeast of greenville downtown, or near taylors, moving southeast at 5 mph (radar indicated). Hazards include 60 mph wind gusts and quarter size hail. Minor hail damage to vehicles is expected. expect wind damage to trees and power lines. Locations impacted include, greenville downtown, greenville eastside, greer, mauldin, taylors, cherrydale point, gsp airport, five forks, paris mountain state park and reidville. 6/26/2018 3:29 PM EDT At 329 pm edt, a severe thunderstorm was located 4 miles north of greenville downtown, or near paris mountain state park, moving southeast at 5 mph (radar indicated). Hazards include 60 mph wind gusts and quarter size hail. Minor hail damage to vehicles is expected. Expect wind damage to trees and power lines. 6/24/2018 5:38 PM EDT The severe thunderstorm warning for greenville, northeastern anderson and eastern pickens counties will expire at 545 pm edt, the storms which prompted the warning have weakened below severe limits, and are starting to move east of greenville county. therefore, the warning will be allowed to expire on schedule. 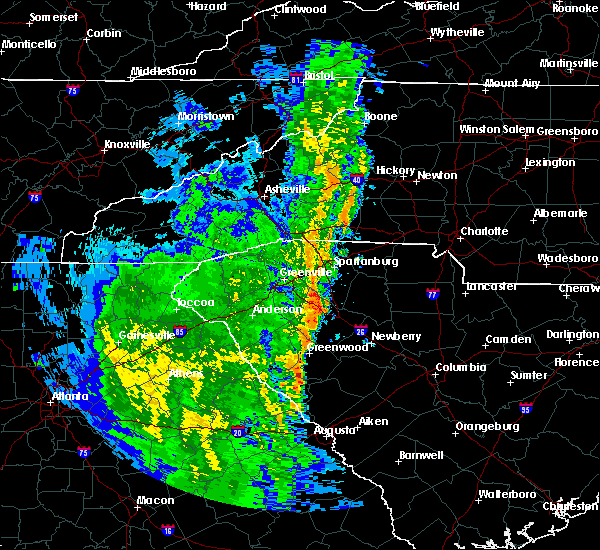 however, gusty winds of 30 to 40 mph are still possible behind these thunderstorms through 6 pm. 6/24/2018 5:21 PM EDT At 521 pm edt, severe thunderstorms were located along a line extending from 20 miles southwest of columbus to 3 miles east of greenville downtown to 10 miles southeast of easley, moving east at 45 mph (radar indicated). Hazards include 60 mph wind gusts and penny size hail. Expect damage to trees and power lines. Locations impacted include, greenville downtown, easley, greenville eastside, west greenville, greer, mauldin, taylors, simpsonville, berea and five forks. 6/16/2018 4:41 PM EDT At 441 pm edt, severe thunderstorms were located along a line extending from near greenville downtown to 4 miles south of easley, moving southeast at 10 mph (radar indicated). Hazards include 60 mph wind gusts and quarter size hail. Minor hail damage to vehicles is expected. expect wind damage to trees and power lines. Locations impacted include, greenville downtown, easley, greenville eastside, west greenville, mauldin, simpsonville, berea, welcome, powdersville and piedmont. 6/16/2018 4:19 PM EDT At 419 pm edt, severe thunderstorms were located along a line extending from 4 miles northwest of greenville downtown to 4 miles east of clemson, moving southeast at 10 mph (radar indicated). Hazards include 60 mph wind gusts and quarter size hail. Minor hail damage to vehicles is expected. Expect wind damage to trees and power lines. 5/31/2018 5:24 PM EDT At 524 pm edt, a severe thunderstorm was located 13 miles southwest of spartanburg, or near reidville, moving southeast at 25 mph (radar indicated). Hazards include 60 mph wind gusts. Expect damage to trees and power lines. Locations impacted include, greer, mauldin, taylors, simpsonville, five forks, fountain inn, duncan, lyman, wellford and inman. 5/31/2018 5:00 PM EDT At 500 pm edt, a severe thunderstorm was located 7 miles northeast of greenville downtown, or near taylors, moving southeast at 25 mph (radar indicated). Hazards include 60 mph wind gusts and quarter size hail. Minor hail damage to vehicles is expected. expect wind damage to trees and power lines. Locations impacted include, greenville downtown, greenville eastside, west greenville, greer, mauldin, taylors, simpsonville, berea, five forks and fountain inn. 5/31/2018 4:39 PM EDT At 438 pm edt, a severe thunderstorm was located 9 miles north of greenville downtown, or near travelers rest, moving southeast at 25 mph. several other thunderstorms developing in northern greenville county may become severe as well, particularly one moving south of gowensville and another near berea (radar indicated). Hazards include 60 mph wind gusts and quarter size hail. Minor hail damage to vehicles is expected. Expect wind damage to trees and power lines. 7/14/2017 9:31 PM EDT At 930 pm edt, a severe thunderstorm was located 11 miles east of greenville downtown, or over five forks, moving east at 20 mph (radar indicated). Hazards include 60 mph wind gusts and quarter size hail. Minor hail damage to vehicles is expected. expect wind damage to trees and power lines. Locations impacted include, greenville eastside, mauldin, five forks, gsp airport, reidville, greenville downtown, taylors, simpsonville and greer. 7/14/2017 9:15 PM EDT At 915 pm edt, a severe thunderstorm was located 6 miles southeast of greenville downtown, or near mauldin, moving east at 20 mph (radar indicated). Hazards include 60 mph wind gusts and quarter size hail. Minor hail damage to vehicles is expected. Expect wind damage to trees and power lines. 7/6/2017 3:59 PM EDT At 359 pm edt, a severe thunderstorm was located 9 miles south of greenville downtown, or near piedmont, moving east at 20 mph (radar indicated). Hazards include 60 mph wind gusts and penny size hail. Expect damage to trees and power lines. Locations impacted include, greenville eastside, west greenville, mauldin, simpsonville, five forks, fountain inn, welcome, powdersville, piedmont and williamston. 7/2/2017 8:08 PM EDT The severe thunderstorm warning for east central greenville county will expire at 815 pm edt, the storm which prompted the warning has weakened below severe limits, and no longer poses an immediate threat to life or property. therefore the warning will be allowed to expire. however gusty winds and heavy rain are still possible with this thunderstorm. 7/2/2017 7:52 PM EDT At 752 pm edt, a severe thunderstorm was located 8 miles southeast of greenville downtown, or near mauldin, moving south at 5 mph (radar indicated). Hazards include 60 mph wind gusts and quarter size hail. Minor hail damage to vehicles is expected. expect wind damage to trees and power lines. Locations impacted include, mauldin, simpsonville, donaldson center, fountain inn, five forks and west greenville. 7/2/2017 7:35 PM EDT At 734 pm edt, a severe thunderstorm was located 5 miles southeast of greenville downtown, or near mauldin, and is nearly stationary (radar indicated). Hazards include 60 mph wind gusts and quarter size hail. Minor hail damage to vehicles is expected. Expect wind damage to trees and power lines. 4/3/2017 2:41 PM EDT At 241 pm edt, severe thunderstorms were located along a line extending from 9 miles northwest of spartanburg to 16 miles southeast of greenville downtown, moving northeast at 50 mph (radar indicated). Hazards include 60 mph wind gusts. Expect damage to trees and minor damage to roofs and siding. locations impacted include, simpsonville, five forks, fountain inn, boiling springs sc, duncan, lyman, wellford, inman, campobello and reidville. A tornado watch remains in effect until 900 pm edt for upstate south carolina. 3/30/2017 7:35 PM EDT At 735 pm edt, a severe thunderstorm was located 8 miles southeast of greenville downtown, or near donaldson center, moving northeast at 20 mph (radar indicated). Hazards include 60 mph wind gusts and quarter size hail. Hail damage to vehicles is expected. expect wind damage to roofs, siding, and trees. Locations impacted include, greenville downtown, greenville eastside, west greenville, mauldin, taylors, simpsonville, five forks, fountain inn, donaldson center and welcome. 3/30/2017 7:18 PM EDT At 717 pm edt, a severe thunderstorm was located 9 miles south of greenville downtown, or near donaldson center, moving northeast at 20 mph (radar indicated). Hazards include 60 mph wind gusts and quarter size hail. Hail damage to vehicles is expected. expect wind damage to roofs, siding, and trees. Locations impacted include, greenville downtown, greenville eastside, west greenville, mauldin, taylors, simpsonville, five forks, fountain inn, welcome and donaldson center. 3/30/2017 6:54 PM EDT At 654 pm edt, a severe thunderstorm was located 11 miles northeast of anderson, or near west pelzer, moving northeast at 20 mph (radar indicated). Hazards include 60 mph wind gusts and quarter size hail. Hail damage to vehicles is expected. Expect wind damage to roofs, siding, and trees. 3/21/2017 7:06 PM EDT At 704 pm edt, a severe thunderstorm was located 11 miles east of greenville downtown, or near gsp airport, moving southeast at 15 mph. yet another strong to severe thunderstorm was developing near travelers rest as well (public). Hazards include tennis ball size hail. People and animals outdoors will be injured. expect damage to roofs, siding, windows and vehicles. Locations impacted include, greer, mauldin, taylors, five forks, fountain inn, duncan, lyman, wellford, reidville and paris mountain state park. 3/21/2017 6:28 PM EDT At 627 pm edt, a severe thunderstorm was located 7 miles northeast of greenville downtown, or near taylors, moving southeast at 15 mph. another severe thunderstorm was moving south of greer (radar indicated). Hazards include golf ball size hail. People and animals outdoors will be injured. expect damage to roofs, siding, windows and vehicles. Locations impacted include, greenville downtown, greenville eastside, greer, mauldin, taylors, simpsonville, five forks, fountain inn, travelers rest and duncan. 3/21/2017 5:59 PM EDT At 559 pm edt, a severe thunderstorm was located 7 miles east of greenville downtown, or 4 miles southwest of gsp airport, moving southeast at 20 mph (radar indicated). Hazards include ping pong ball size hail. People and animals outdoors will be injured. Expect damage to roofs, siding, windows and vehicles. 3/21/2017 5:45 PM EDT At 544 pm edt, a severe thunderstorm was located 6 miles east of greenville downtown, or near gsp airport, moving southeast at 15 mph (radar indicated). Hazards include quarter size hail. Damage to vehicles is expected. Locations impacted include, greenville eastside, greer, taylors, travelers rest, duncan, lyman, paris mountain state park, gsp airport, cherrydale point and greenville downtown. 3/21/2017 5:14 PM EDT At 514 pm edt, a severe thunderstorm was located 7 miles northeast of greenville downtown, or near taylors, moving southeast at 15 mph (radar indicated). Hazards include ping pong ball size hail. People and animals outdoors will be injured. Expect damage to roofs, siding, windows and vehicles. 3/1/2017 6:53 PM EST At 652 pm est, severe thunderstorms were located along a line extending from 11 miles north of downtown greenville, to 7 miles southeast of easley, moving east at 60 mph (radar indicated). Hazards include 70 mph wind gusts and penny size hail. Expect considerable tree damage. damage is likely to mobile homes, roofs and outbuildings. Locations impacted include, greenville downtown, greenville eastside, west greenville, greer, mauldin, taylors, berea, welcome, powdersville and piedmont. 3/1/2017 6:33 PM EST At 633 pm est, severe thunderstorms were located along a line extending from 8 miles north of pickens to 3 miles northwest of clemson, moving east at 65 mph (radar indicated). Hazards include 60 mph wind gusts and nickel size hail. Expect damage to roofs. Siding and trees. 3/1/2017 6:22 PM EST At 622 pm est, severe thunderstorms were located along a line extending from 7 miles northeast of pickens to 4 miles southwest of anderson, moving northeast at 60 mph (radar indicated). Hazards include 60 mph wind gusts and quarter size hail. Hail damage to vehicles is expected. expect wind damage to roofs, siding and trees. Locations impacted include, greenville downtown, anderson, easley, pickens, greenville eastside, west greenville, greer, mauldin, taylors and simpsonville. 3/1/2017 6:10 PM EST At 610 pm est, severe thunderstorms were located along a line extending from near pickens to 6 miles northeast of hartwell, moving northeast at 60 mph (radar indicated). Hazards include 60 mph wind gusts and quarter size hail. Hail damage to vehicles is expected. expect wind damage to roofs, siding and trees. Locations impacted include, greenville downtown, anderson, easley, clemson, hartwell, pickens, greenville eastside, west greenville, greer and mauldin. 3/1/2017 5:50 PM EST At 550 pm est, severe thunderstorms were located along a line extending from 3 miles southeast of walhalla to 7 miles east of carnesville, moving northeast at 60 mph (radar indicated). Hazards include 60 mph wind gusts and quarter size hail. Hail damage to vehicles is expected. Expect wind damage to roofs, siding and trees. 11/30/2016 4:45 PM EST At 443 pm est, a severe thunderstorm capable of producing a tornado was located 10 miles south of greenville downtown, or near donaldson center, moving east at 55 mph (radar indicated rotation. the rotation has strengthend and become tighter, indicating potential tornado development). Hazards include tornado. Flying debris will be dangerous to those caught without shelter. mobile homes will be damaged or destroyed. damage to roofs, windows and vehicles will occur. tree damage is likely. this tornado will be near, fountain inn and five forks around 450 pm est. Other locations impacted by this dangerous storm include fork shoals. 11/30/2016 4:35 PM EST At 434 pm est, a severe thunderstorm capable of producing a tornado was located 12 miles southeast of easley, or near west pelzer, moving east at 40 mph (the radar indicated rotation has increased in speed indicating another tornado could develop). Hazards include tornado. Flying debris will be dangerous to those caught without shelter. mobile homes will be damaged or destroyed. damage to roofs, windows and vehicles will occur. tree damage is likely. this dangerous storm will be near, donaldson center and mauldin around 450 pm est. fountain inn, simpsonville and five forks around 500 pm est. Other locations impacted by this dangerous storm include fork shoals. 11/30/2016 4:26 PM EST At 423 pm est, a severe thunderstorm capable of producing a tornado was located 8 miles north of anderson, or 6 miles west of williamston, moving east at 45 mph (radar indicated rotation. at 214 pm est...radar indicated a tornado signature east of sandy springs. the radar still shows significant roation with the storm, but the tornado signature has weakened. another tornado may still develop). Hazards include tornado. Flying debris will be dangerous to those caught without shelter. mobile homes will be damaged or destroyed. damage to roofs, windows and vehicles will occur. tree damage is likely. this dangerous storm will be near, west pelzer and williamston around 430 pm est. donaldson center and piedmont around 440 pm est. 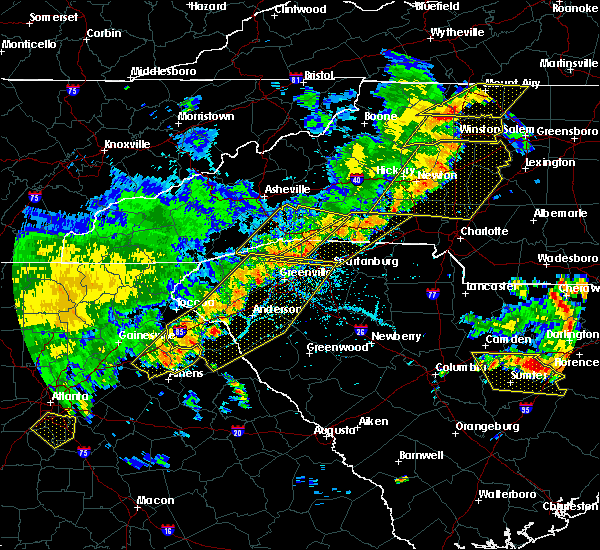 simpsonville, fountain inn and mauldin around 450 pm est. 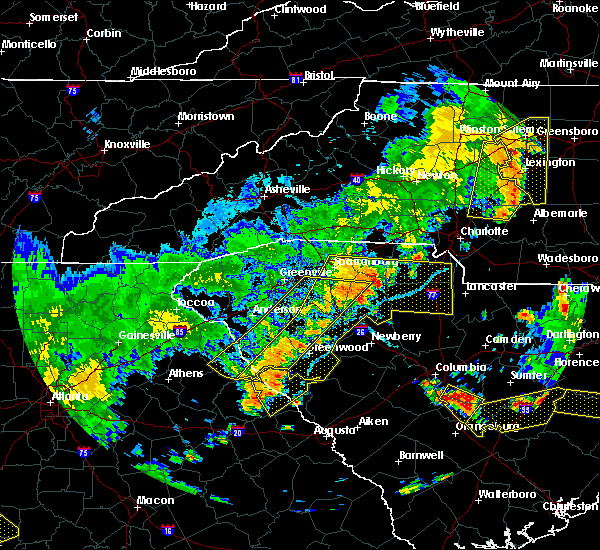 five forks around 500 pm est. Other locations impacted by this dangerous storm include fork shoals. 11/30/2016 4:12 PM EST At 412 pm est, a severe thunderstorm capable of producing a tornado was located 6 miles northwest of anderson, or near northlake, moving east at 55 mph (radar indicated rotation). Hazards include tornado. Flying debris will be dangerous to those caught without shelter. mobile homes will be damaged or destroyed. damage to roofs, windows and vehicles will occur. tree damage is likely. this dangerous storm will be near, west pelzer, williamston and piedmont around 430 pm est. simpsonville, donaldson center and mauldin around 440 pm est. 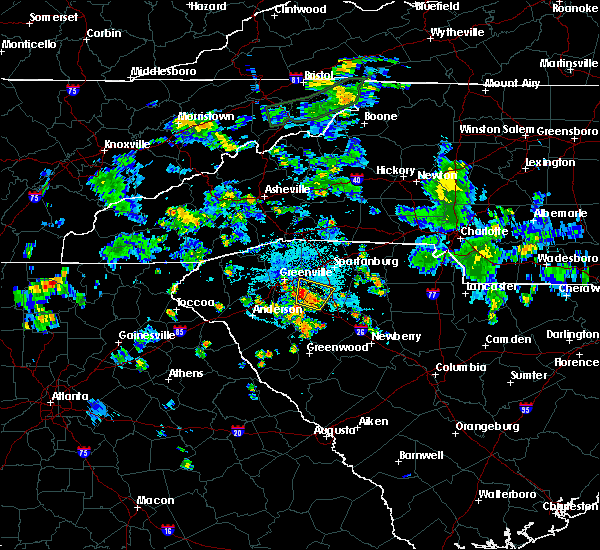 fountain inn and five forks around 450 pm est. Other locations impacted by this dangerous thunderstorm include fork shoals and sandy springs. 8/17/2016 6:18 PM EDT At 618 pm edt, a severe thunderstorm was located 11 miles southeast of greenville downtown, or near simpsonville, moving east at 15 mph (radar indicated). Hazards include 60 mph wind gusts and nickel size hail. Expect damage to roofs. Siding and trees. 8/7/2016 6:23 PM EDT At 623 pm edt, a severe thunderstorm was located 13 miles southeast of greenville downtown, or near simpsonville, moving northwest at 10 mph (radar indicated). Hazards include 60 mph wind gusts. Expect damage to roofs. siding and trees. Locations impacted include, five forks, fountain inn, gray court, woodruff and simpsonville. 8/7/2016 5:58 PM EDT At 557 pm edt, a severe thunderstorm was located 13 miles northwest of laurens, or near fountain inn, and is moving north at 5 mph (radar indicated). Hazards include 60 mph wind gusts. Expect damage to roofs. Siding and trees. 7/17/2016 6:54 PM EDT The severe thunderstorm warning for west central spartanburg and east central greenville counties will expire at 700 pm edt, the storm which prompted the warning has weakened below severe limits, and no longer poses an immediate threat to life or property. therefore the warning will be allowed to expire. however heavy rain is still possible with this thunderstorm. 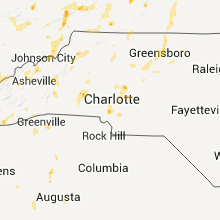 if you observed large hail or wind damage, please report it to the national weather service greenville-spartanburg by calling toll free, 1, 800, 2 6 7, 8 1 0 1, or by posting on our facebook page, or tweet it using hashtag nwsgsp. your message should describe the event and the specific location where it occurred. 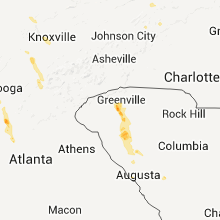 7/17/2016 6:43 PM EDT At 642 pm edt, a rain shower capable of producing damaging winds was located 5 miles southeast of greenville downtown, or near mauldin, and is nearly stationary (radar indicated). Hazards include 60 mph wind gusts. Expect damage to roofs. siding and trees. Locations impacted include, greenville downtown, greenville eastside, west greenville, mauldin, taylors, simpsonville, five forks, cherrydale point, donaldson center and welcome. 7/17/2016 6:11 PM EDT At 611 pm edt, a severe thunderstorm was located 4 miles east of greenville downtown, or near greenville eastside, moving southeast at 5 mph (radar indicated). Hazards include 60 mph wind gusts and nickel size hail. Expect damage to roofs. Siding and trees. 7/11/2016 3:14 PM EDT At 314 pm edt, a severe thunderstorm was located 9 miles east of greenville downtown, or near five forks, moving northeast at 10 mph (radar indicated). Hazards include 60 mph wind gusts and quarter size hail. Hail damage to vehicles is expected. Expect wind damage to roofs, siding and trees. 7/8/2016 8:56 PM EDT At 855 pm edt, severe thunderstorms were located along a line extending from 8 miles northeast of hendersonville to 7 miles east of hartwell, moving east at 35 mph (radar indicated). Hazards include 60 mph wind gusts and quarter size hail. Hail damage to vehicles is expected. Expect wind damage to roofs, siding and trees. 6/1/2016 5:57 PM EDT At 557 pm edt, a severe thunderstorm was located 13 miles northeast of greenville downtown, or near greer, moving southwest at 5 mph (radar indicated). Hazards include 60 mph wind gusts and nickel size hail. Expect damage to roofs. Siding and trees. 5/12/2016 7:28 PM EDT The severe thunderstorm warning for northwestern laurens and southeastern greenville counties will expire at 730 pm edt, the storm which prompted the warning has weakened below severe limits, and no longer poses an immediate threat to life or property. therefore the warning will be allowed to expire. 5/12/2016 7:18 PM EDT At 717 pm edt, a severe thunderstorm was located 13 miles southeast of greenville downtown, or near fountain inn, moving east at 25 mph (radar indicated). Hazards include 60 mph wind gusts. Expect damage to roofs. siding and trees. Locations impacted include, mauldin, simpsonville, five forks, fountain inn and fork shoals. 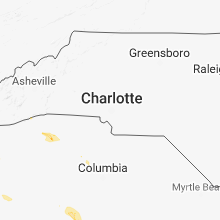 5/12/2016 6:51 PM EDT At 651 pm edt, a severe thunderstorm was located 12 miles south of downtown greenville, or 4 miles south of donaldson center airport, moving east at 30 mph (radar indicated). Hazards include 60 mph wind gusts. Expect damage to roofs. Siding and trees. 3/14/2016 6:19 PM EDT At 618 pm edt, doppler radar indicated a severe thunderstorm with a history of producing large hail up to ping pong ball size and damaging winds in excess of 60 mph. this storm was located 12 miles east of greenville downtown, or near gsp airport, moving east at 35 mph. locations impacted include, greenville downtown, greenville eastside, west greenville, greer, taylors, welcome, travelers rest, duncan, lyman and wellford. 3/14/2016 6:00 PM EDT At 559 pm edt, doppler radar indicated a severe thunderstorm capable of producing quarter size hail and damaging winds in excess of 60 mph. this storm was located 4 miles northeast of greenville downtown, or near taylors, moving east at 40 mph. locations impacted include, greenville downtown, greenville eastside, west greenville, greer, taylors, welcome, travelers rest, duncan, lyman and wellford. 3/14/2016 5:44 PM EDT At 543 pm edt, doppler radar indicated a severe thunderstorm capable of producing large damaging hail up to golf ball size and hurricane force winds in excess of 70 mph. this storm was located 7 miles northeast of easley, or near berea, and moving east at 40 mph. * locations in the warning include, greenville downtown, greenville eastside, west greenville, greer, taylors, berea, welcome, travelers rest, duncan and lyman. 8/6/2015 3:40 PM EDT At 340 pm edt, doppler radar indicated a line of severe thunderstorms capable of producing damaging winds in excess of 60 mph. these storms were located along a line extending from 16 miles west of spartanburg to 7 miles south of greenville downtown, moving east at 30 mph. nickel size hail may also accompany the damaging winds. locations impacted include, mauldin, simpsonville, greenville eastside, donaldson center, piedmont, fork shoals, greenville downtown, five forks, taylors and west greenville. 8/6/2015 3:26 PM EDT At 325 pm edt, doppler radar indicated a line of severe thunderstorms capable of producing damaging winds in excess of 60 mph. these storms were located along a line extending from 4 miles northeast of greenville downtown to 9 miles southeast of easley, moving east at 30 mph. nickel size hail may also accompany the damaging winds. locations impacted include, greenville downtown, mauldin, simpsonville, welcome, powdersville, piedmont, west pelzer, greenville eastside, west greenville and donaldson center. 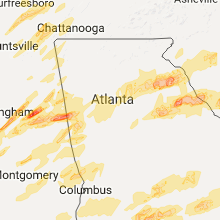 8/6/2015 3:03 PM EDT At 303 pm edt, doppler radar indicated a line of severe thunderstorms capable of producing damaging winds in excess of 60 mph. these storms were located along a line extending from 4 miles northeast of easley to 9 miles east of clemson, and moving east at 30 mph. nickel size hail may also accompany the damaging winds. * locations in the warning include, greenville downtown, easley, mauldin, simpsonville, berea, welcome, powdersville, piedmont, west pelzer and greenville eastside. 8/5/2015 8:19 PM EDT At 818 pm edt, doppler radar indicated a severe thunderstorm capable of producing damaging winds in excess of 60 mph. this storm was located 8 miles east of greenville downtown, or near gsp airport, moving east at 15 mph. penny size hail may also accompany the damaging winds. locations impacted include, greenville downtown, greer, taylors, travelers rest, duncan, reidville, gsp airport, furman university, greenville eastside and lake robinson. 8/5/2015 7:53 PM EDT At 753 pm edt, doppler radar indicated a severe thunderstorm capable of producing damaging winds in excess of 60 mph. this storm was located near greenville downtown, or near taylors, and moving east at 10 mph. penny size hail may also accompany the damaging winds. * locations in the warning include, greenville downtown, greer, taylors, berea, welcome, travelers rest, duncan, reidville, gsp airport and furman university. 7/18/2015 5:15 PM EDT At 514 pm edt, doppler radar indicated a line of severe thunderstorms capable of producing quarter size hail and damaging winds in excess of 60 mph. these storms were located along a line extending from 11 miles southeast of greenville downtown to 16 miles northeast of anderson to 11 miles south of easley, and moving south at 25 mph. * locations in the warning include, simpsonville, five forks, fountain inn, piedmont, belton, williamston, honea path, west pelzer, fork shoals and donaldson center. 6/27/2015 4:46 PM EDT At 446 pm edt, doppler radar indicated a severe thunderstorm capable of producing damaging winds in excess of 60 mph. this storm was located near taylors, moving southeast at 15 mph. penny size hail may also accompany the damaging winds. locations impacted include, greenville downtown, mauldin, taylors, greenville eastside, greer, five forks, welcome, duncan, lyman and wellford. 6/27/2015 4:24 PM EDT At 424 pm edt, doppler radar indicated a severe thunderstorm capable of producing quarter size hail and damaging winds in excess of 60 mph. this storm was located near greenville downtown, or near berea, and moving east at 20 mph. 6/23/2015 5:43 PM EDT The severe thunderstorm warning for northwestern laurens, southwestern spartanburg and east central greenville counties will expire at 545 pm edt, the storm which prompted the warning has weakened below severe limits, and no longer poses an immediate threat to life or property. therefore the warning will be allowed to expire. however gusty winds and lightning are still possible with this thunderstorm. 6/23/2015 5:25 PM EDT At 524 pm edt, doppler radar indicated a severe thunderstorm capable of producing quarter size hail and damaging winds in excess of 60 mph. this storm was located 6 miles east of mauldin, or near five forks, moving southeast at 10 mph. locations impacted include, mauldin, simpsonville, five forks, fountain inn, woodruff, gray court, reidville, gsp airport, enoree and moore. 6/23/2015 5:01 PM EDT At 500 pm edt, doppler radar indicated a severe thunderstorm capable of producing quarter size hail and damaging winds in excess of 60 mph. this storm was located near mauldin, or near five forks, and moving southeast at 15 mph. 6/18/2015 6:23 PM EDT At 621 pm edt, doppler radar indicated a severe thunderstorm capable of producing damaging winds in excess of 60 mph. this storm was located near mauldin, or near donaldson center, moving northeast at 15 mph. penny size hail may also accompany the damaging winds. another severe thunderstorm cell was developing near mauldin. this will likely produce more wind damage near mauldin. locations impacted include, greenville downtown, mauldin, taylors, greenville eastside, simpsonville, five forks, fountain inn, welcome, powderville and piedmont. 6/18/2015 6:08 PM EDT At 607 pm edt, doppler radar indicated a severe thunderstorm capable of producing damaging winds in excess of 60 mph. this storm was located 7 miles southwest of mauldin, or near piedmont, and moving northeast at 10 mph. penny size hail may also accompany the damaging winds. another potentially severe thunderstorm was located 2 miles southwest of simpsonville. 6/9/2015 7:21 PM EDT At 720 pm edt, doppler radar indicated a severe thunderstorm capable of producing quarter size hail and damaging winds in excess of 60 mph. this storm was located 4 miles south of mauldin, or near donaldson center. this storm was nearly stationary. locations impacted include, mauldin, simpsonville, five forks, fountain inn, gray court, fork shoals, woodruff and greenville eastside. 6/9/2015 6:54 PM EDT At 653 pm edt, doppler radar indicated a severe thunderstorm capable of producing quarter size hail and damaging winds in excess of 60 mph. this storm was located 7 miles east of mauldin, or near five forks. this storm was nearly stationary. 6/9/2015 6:31 PM EDT At 631 pm edt, doppler radar indicated a severe thunderstorm capable of producing quarter size hail and damaging winds in excess of 60 mph. this storm was located 4 miles north of mauldin, or near greenville eastside. this storm was nearly stationary. locations impacted include, greenville downtown, mauldin, taylors, greenville eastside, simpsonville, five forks, fountain inn, welcome, powderville and piedmont. 6/9/2015 6:19 PM EDT At 618 pm edt, doppler radar indicated a severe thunderstorm capable of producing quarter size hail and damaging winds in excess of 60 mph. this storm was located near mauldin, or near greenville eastside, and moving southwest at 10 mph. 5/26/2015 8:18 PM EDT At 817 pm edt, doppler radar indicated a line of severe thunderstorms capable of producing damaging winds in excess of 60 mph. these storms were located along a line extending from 10 miles north of taylors to 10 miles southwest of spartanburg, moving northeast at 40 mph. penny size hail may also accompany the damaging winds. locations impacted include, taylors, greer, duncan, lyman, wellford, reidville, gsp airport, lake robinson, paris mountain state park and travelers rest. 5/26/2015 8:12 PM EDT At 811 pm edt, doppler radar indicated a line of severe thunderstorms capable of producing damaging winds in excess of 60 mph. these storms were located along a line extending from 7 miles north of taylors to 11 miles east of mauldin, moving northeast at 40 mph. penny size hail may also accompany the damaging winds. locations impacted include, greenville downtown, mauldin, taylors, greenville eastside, greer, simpsonville, five forks, fountain inn, travelers rest and woodruff. 5/26/2015 8:00 PM EDT At 758 pm edt, doppler radar indicated a line of severe thunderstorms capable of producing damaging winds in excess of 60 mph. these storms were located along a line extending from 5 miles northwest of taylors to 7 miles southeast of mauldin, moving northeast at 50 mph. this line has a long history of wind damage from southern greenville county west across the savannah river valley. penny size hail may also accompany the damaging winds. locations impacted include, greenville downtown, mauldin, taylors, greenville eastside, greer, simpsonville, berea, five forks, fountain inn and welcome. 5/26/2015 7:47 PM EDT At 746 pm edt, doppler radar indicated a line of severe thunderstorms capable of producing damaging winds in excess of 60 mph. these storms were located along a line extending from near greenville downtown to 14 miles west of laurens, moving northeast at 45 mph. 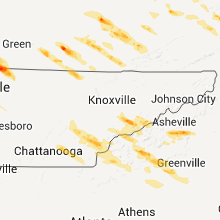 this line of storms produced widespread tree and power line damage across anderson county. penny size hail may also accompany the damaging winds. locations impacted include, greenville downtown, mauldin, taylors, greenville eastside, greer, simpsonville, berea, five forks, fountain inn and welcome. 5/26/2015 7:30 PM EDT At 730 pm edt, doppler radar indicated a line of severe thunderstorms capable of producing damaging winds in excess of 60 mph. these storms were located along a line extending from 5 miles south of easley to 13 miles north of abbeville, and moving northeast at 40 mph. penny size hail may also accompany the damaging winds. 4/20/2015 1:42 PM EDT At 141 pm edt, doppler radar indicated a severe thunderstorm capable of producing quarter size hail and damaging winds in excess of 60 mph. this storm was located 6 miles west of pickens, or near six mile, and moving east at 45 mph. 4/20/2015 1:21 PM EDT At 120 pm edt, doppler radar indicated a severe thunderstorm capable of producing quarter size hail and damaging winds in excess of 60 mph. this storm was located over taylors, and moving northeast at 30 mph. 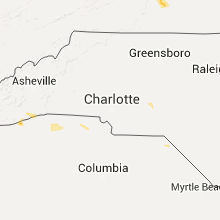 4/9/2015 4:58 PM EDT A severe thunderstorm warning remains in effect until 515 pm edt for northwestern laurens and southeastern greenville counties. at 457 pm edt. doppler radar indicated a severe thunderstorm capable of producing quarter size hail and damaging winds in excess of 60 mph. this storm was located 8 miles southeast of mauldin. or over fountain inn. Moving northeast at 35 mph. 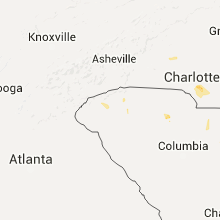 4/9/2015 4:45 PM EDT The national weather service in greenville-spartanburg has issued a * severe thunderstorm warning for. 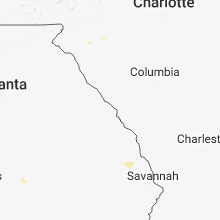 northwestern laurens county in upstate south carolina. southeastern greenville county in upstate south carolina. until 515 pm edt * at 444 pm edt. Doppler radar indicated a severe thunderstorm.